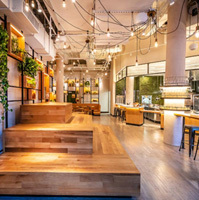 Israeli chef Erez Komarovsky and partners have opened Mint Kitchen in Union Square, offering healthy take on modern Israeli cuisine. Warm Jaffa Hummus with Roasted Mushrooms, Steak with Bonfire Potatoes, Shrimp Kebabs with Spicy Mango Salad; and Falafel Crusted Salmon are among the offerings. Frozen yogurt made with goat milk is offered with seasonal fruit toppins, and toasted pistachios with cassis syrup. The restaurant seats 50 with an open kitchen. The centerpiece is a large copper taboon oven.